On this day, ten years ago, began our journey with our son coming into this world. I went into Holland Hospital with pre-term labor, thought I was nuts for going in, thought they would send me home, but they admitted me! I was released two days later only to return to the hospital early on Saturday morning, May 9, 1998. Following a 15 minute ambulance ride to Butterworth Hospital in Grand Rapids (usually a 35 minute drive), our son was born. Jarod Evan weighed 1313 grams (approx. 2 pounds, 14 ounces). He was 11 weeks early, born at 29 weeks gestation. He spent four weeks in NICU and two weeks in NIM at the Helen DeVos Childrens Hospital in Grand Rapids, MI. He was born the day before Mother's Day and came home on Father's Day, a month before his original due date of July 23, 2008. He then weighed 4 pounds, 10 ounces. 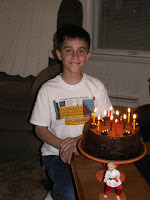 Jarod will be ten years old this Friday, May 9 and he is a wonderful, healthy, "normal" boy. There is SO much more to the story, but I just wanted to document this briefly on this day. What a story! I had no idea your son was a preemie, and such an early one at that! Glad everything turned out well!